Geraldton locals got active last Sunday to raise funds for charity at the sixth annual Chevron City to Surf for Activ. A strong field of runners took to the start line with coastal winds providing an encouraging push, before rapidly turning to gale force headwinds on the approach to the finish. This was no easy feat, even for the fittest participants. Up for the challenge, returning runner, Francisco Sanzana pushed through to take out first place in the men’s 12km course in a competitive time of 39 minutes, backing up his second place title in 2017. Leading the under 16’s in the 12km course and finishing in fifth place overall, was the inspirational Lachlan Taylor-Greaves finishing in a time of 49 minutes, 12 seconds. Originally from Bruce Rock, Lachlan attends high school in Perth and, along with his family, is travelling to every 12km event, which will see him complete his series goal at City Beach in Perth on 26 August. Lachlan commented, “One year ago, I decided to take on the challenge of completing the Chevron City to Surf for Activ Series, running all 12km events in Albany, Busselton, Geraldton Karratha and Perth. A long-time family friend, Dave Bromberg paid some of my series entry fees so that I could do what I love, running! Sadly later in the series he passed away of terminal cancer, but has continued to be an inspiration to me and a huge driving force when it comes to my love for running. Amongst the females, local face Marilyn Hearne led the 12km participants arriving in first place by a number of minutes and finishing with a time of 59 minutes, 48 seconds. “This is the fifth year I have run in the Chevron City to Surf for Activ in Geraldton and I am thrilled to be able to participate in this fun run which supports the Activ Foundation. Although conditions were a little cold and windy, the event on Sunday was a great success with participants of all ages. A huge thank you to the enormous number of volunteers who supported us on the day – without their help, events like this would not be possible,” commented Marilyn. On the 4km track, Luke Burrows (17) sped through the finish line taking out first place amongst all men in a time of 13 minutes, 09 seconds. Not far behind in second place was Daniel Rubick, who finished in 13 minutes, 58 seconds. The morning brought many incredible runners and walkers to the course front, including some impressive sibling rivalry. Georgia and Elijah Burrows, a brother and sister duo, each took out third place in their 4km respective races. Kurt Wesley (17), ran his way into third place in the 12km heat, after taking first place on the Albany 12km track last month, while his sister, Aleisha (19) won the women’s 4km in a time of 16 minutes, 33 seconds. Finally, the Cachard brothers smashed through the finish line in the under 16 boys category; Will taking out second place in the 12km, in a time of 50 minutes, 59 seconds; and Noah taking out first place in the 4km, in a time of 14 minutes, 51 seconds. The 2018 Activ All Star team fronted the 4km course, including Mia Rodriguez, Christie Erenshaw, Paul Mitchell, Raziel Rodgers and local favourite Kiralee Chidlow. “Since coming under the wing of Activ, it’s been so heartwarming to see Kiralee empowered as a valued and confident member of our local Activ group and her community – she loved being the centre of attention over the weekend as our local Activ Hero,” commented Hiedelee Jupp, Activ Team Leader and carer for Kiralee. Full results for the Geraldton 2018 Chevron City to Surf for Activ are available at PerthNow.  The 2018 Chevron City to Surf for Activ is Activ’s largest annual fundraiser, providing valuable programs and services for thousands of people living with disability.